The Living Desert Reserve is nestled amongst the Barrier Ranges and is located 9km from the City of Broken Hill. The topography, scenery and views within the 2400ha reserve are breathtaking and can be explored through the numerous walking trails available for various fitness levels. Another major attraction within the Living Desert is the Sculpture Site. A successful sculpture symposium was held on this majestic hilltop (within the centre of the reserve) in 1993 by artists from around the world, under the direction of organiser and artist Lawrence Beck. 12 sandstone sculptures highlight the skyline, all with a story to tell. Bajo El Sol Jaguar (Under the Jaguar Sun) by Antonio Nava Tirado in Sculpture Symposium near Broken Hill, NSW Australia on the photo. The sculpture depicts Duality: Day and Night where Night is represented by the Star of Venus, the mouth. Day is represented by the circle of created by the sun. This is probably the most photographed sculpture ever, on media, printed brochures and magazines, making of the Broken Hill Sculptures an international artwork. This image belongs to the travel and nature stock photo library. This stock photo of Broken Hill Sculpture Symposium at Sunset is available for licensing for commercial and editorial uses including websites, blogs, books, magazines, brochures and advertising. Restrictions may apply for images which contain third party copyrighted material or sensitive subjects. Photos of artwork are for editorial use only. 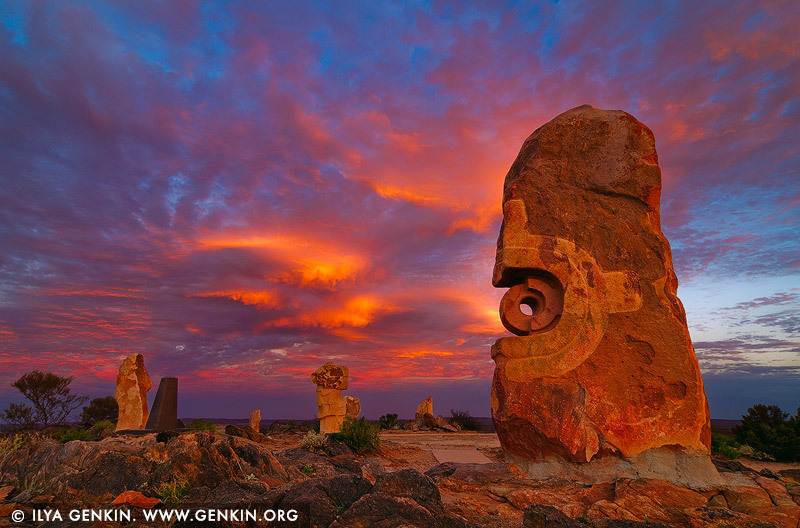 This image id AU-BROKEN-HILL-0011 of Broken Hill Sculpture Symposium at Sunset, is copyrighted © by Ilya Genkin. This is not a public domain image.